Need an idea for a holiday potluck? 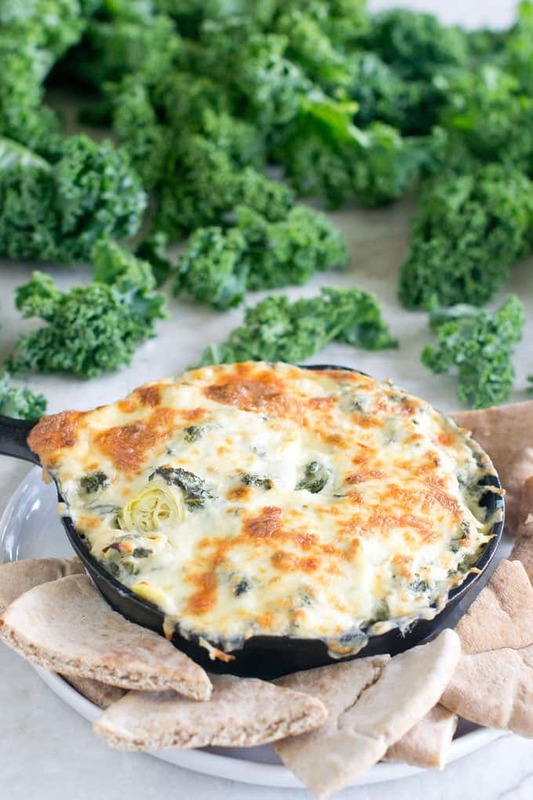 Make our Kale Artichoke Dip. 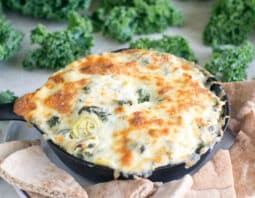 It’s a twist on the classic spinach dip but made with kale. It’s tough to beat a hot and cheesy spinach and artichoke dip. Such a total crowd-pleaser. But, we think we’ve done it here. This version uses tasty extra-healthy kale instead of spinach. We used the bagged SuperFit chopped kale to make this quick and easy. It also, of course, has the artichokes. We prefer the ones that are canned and packed in water (like this) over marinated artichoke hearts because we don’t really want an acidic or briny flavor here. But if you have a brand of marinated artichokes that you love, go wit hit. The dip also has Greek yogurt in there for creaminess, along with cream cheese, mozzarella and Parmesan for all that very important cheese. The best thing about this dip (other than the taste!) is that it’s super-quick to make with only about 10 minutes of hands-on time. Then it goes into the oven and is ready when it’s bubbling, about 20 minutes. Enjoy! Our Kale Ebook is Out! Preheat oven to 425°F. In a large saucepan warm the olive oil over low heat. Add the garlic. Stir 1 minute. Increase heat to medium-high and add the kale and salt. Cook while stirring until very wilted, 3 minutes. Remove from heat. Stir in artichokes, cream cheese, mozzarella, Parmesan and black pepper. Once well-combined, stir in yogurt. Transfer to a baking dish and bake until browned on top and bubbling, 20-25 minutes. Disclosure: I was hired by SuperFit Greens to develop this recipe for the packaging and I have permission to use the recipe and picture on this site. However, I have not been compensated in any way to promote SuperFit on my sites or on social media. All opinions are my own.